Patron Saint of Motorcyclists -St. Columbanus of Bobbio’s Feast Day! November 23rd. I’m packing up Big Red, my 2004 Harley Road King Classic, and heading out on a trip tomorrow. Here in Georgia USA the weather’s supposed to be in the low 70’s. I’ve got hula girl standing and swaying on the bike where my clock used to be- she’s there to remind me to have fun and not take things, myself included, too seriously. In my windshield bag I’ve got a cross and some prayer beads – to keep me reverent, and I’ve got a medal celebrating the patron saint of motorcyclists – St. Columbanus. Tomorrow is his feast day which should augur well for a safe trip. But who decided he was the one who would be the patron saint? Apparently, the Vatican and the Harley Davidson company who made a medal promoting him. And just who was this St Columbanus of Bobbio? Despite the Italian ‘Bobbio’, this guy was an Irish dude! What a surprise! During the dark ages in the sixth and seventh centuries when the Irish were saving civilization and Christianity, he ventured away from Ireland wandering up and down Europe starting monasteries and spreading the word about Christ. How do we know he was Irish? Apparently what cinches it is that that we know he lived at home with his mother into his 30’s, he wasn’t married, and he didn’t have a job. Ha ha! (Old Irish joke). Seriously though, the story goes that he was tall and good looking and the girls chased him (I can relate to that except for the tall bit, and the good looking part and, well…). He was also a bit of a wild guy with the ladies, who chased after him -okay, okay so there’s no resemblance between us at all! Gimme a break. Anyway, a holy woman put the fear of God in him and he decided to change his wild ways and become a priest. When his mother found out she tried to block the door physically with her body, but he just stepped over her, signed up and got his traveling orders. He traveled throughout Europe, to Germany and Switzerland and ended up living in decadent France for 20 years, establishing three monasteries there before he moved to Italy. He carried his Celtic Christian ideas and practices with him. But my favorite is that he multiplied bread and beer for his community. We’re talking about craft, micro-brewed beer here! Bikers love their fresh beer! If Columbanus were alive today I imagine him riding a Road King like mine. If not, maybe a Harley Fat Boy. The Fat Boy is a living legend. Arnold Schwarzenegger rode one in “Terminator 2”. Its got a 1,584cc pushrod V-twin engine, six gears, massive torque and you’ve got to love those shotgun-style tailpipes. It’s nimble, has no saddlebags and is perfect for itinerant monks flying around on those twisty heathen roads in Europe. Combine all this with Christianity and you can’t be beat! Love and a Fat Boy can conquer all! I like what the Monk Jonas wrote in the seventh century about one of the miracles of Columbanus. A while after, Columbanus went to the monastery of Fontaines and found sixty brethren hoeing the ground and preparing the fields for the future crop. When he saw them breaking up the clods with great labor, he said, “May the Lord prepare for you a feast, my brethren.” Hearing this the attendant said, “Father, believe me, we have only two loaves and a very little beer.” Columbanus answered, “Go and bring those.” The attendant went quickly and brought the two loaves and a little beer. Columbanus, raising his eyes to heaven, said, “Christ Jesus, only hope of the world, do Thou, who from five loaves satisfied five thousand men in the wilderness, multiply these loaves and this drink.” Wonderful faith! All were satisfied and each one drank as much as he wished. The servant carried back twice as much in fragments and twice the amount of drink. So I hope you will celebrate his feast day on November 23rd in some appropriate fashion. I’ll be hitting the highway. ← My Book is Published! Hope Bats Last. 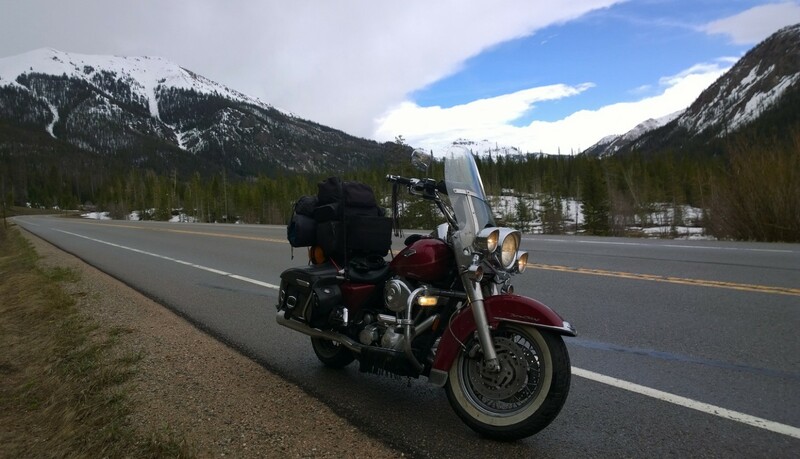 Cross Country Motorcycle Trip. Wonderful! Have a great ride. Should be a terrific day tomorrow. I may head up to Blue Ridge and other parts north myself. It sounds like St. Columbanus had a problem similar to mine. He was chased by all those ladies. I’m being chased by falling oak leaves. Something tells me his plight was worse than mine! Have a great ride and enjoy being in the present as best you can. Still struggling with being in the present myself. My guess is that many others living in the culture of instant information and sensual immediacy are struggling with being in the present too. I hope those who ride – and those who don’t – recognize how riding a motorcycle creates an opportunity to be in the present. May peace be with you.